In the past month, I haven’t really made any effort to archive my posts on the soon-to-be-gone FriendFeed. Instead I’ve been focused on lending a hand in finding a new home for my go-to place for professional support, advice, and gossip: the Library Society of the World (LSW). Yesterday, some of us helped launch an instance of the open-source forum software, Discourse, on a server administered by a few folks long part of the LSW community. Our online barn raising has been a whirlwind of great ideas, debate about needed functionality, and worry about features in FriendFeed that can’t be replicated on the new platform. You can check out our work so far, and, even better, sign up now and join in. Today, I took a breather from the discussions about how to make Discourse more useful and fun for the LSW community and decided to click back in time through page after page of my FriendFeed posts. I may yet archive all my posts in the remaining hours. 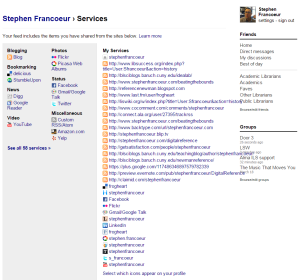 But for now, I’d like to use this post to offer a few snapshots, and document my time at FriendFeed. 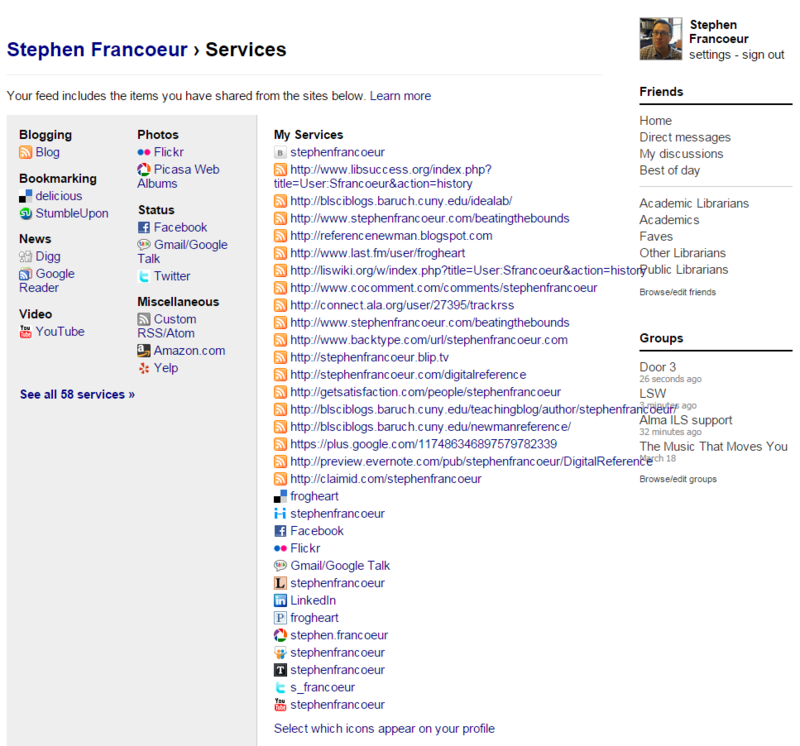 I joined FriendFeed on April 8, 2008, with no clue that seven years and one day later, FriendFeed would be gone. Some anniversary. At the time, I was busy planning with Steven Kaye and Rachel Watstein an unconference, Library Camp NYC, which was held at the college where I worked and remains one of my favorite things I’ve done in fifteen years as a librarian. One thing that gave me great pleasure was the way an article or blog post that I’d read and automatically shared in FriendFeed (via the feed of read items from my Google Reader account and then later via my feed from my commonplace book on Tumblr) would then launch a threaded discussion related to the item shared. It happened again and again, and showed me the power of being able to write things once but publish them multiply for greater network effects. There have been many wonderful blog posts in the past few weeks from FriendFeed fans about what they got out of the site (and a really nice analysis of and commentary on those posts in Walt Crawford‘s May 2015 issue of Cites and Insights). Since so many wonderful things have already been said, I’ll just say thanks to all my good friends there and hope I find them elsewhere online in the days and years to come.